He has exhibited at many art groups including the American Artists Professional League, N.Y.C., the Salmagundi Club, Fifth Ave., N.Y., Hudson Valley Art Association, Hastings-on-Hudson, N.Y., Chelsea, Center East Norwich, N.Y., National Art League, N.Y.C., and the Southern Vermont Art Center, Manchester, Vermont. Don is a board member and past Treasurer of the American Artists Professional League, N.Y.C., a resident artist and member of the art committee of the Salmagundi Club, N.Y.C., past President of the Suburban Art League, Woodbury, N.Y., member of the Hudson Valley Art Association and the Southern Vermont Art Center. He has won the top award of "Best Atmosphere" oil painting at the American Artists Professional League Grand National Open Exhibition in N.Y.C.. He has also won the Grumbacher Gold Medal Award and numerous other awards, including two Bests-in-Show at Suburban Art League, Best-in-Show at Tri-County Artists, Silver Medal for Oil at the National Art League, and frequent awards of excellence at Suburban Art League. Don has painted plein air landscapes with the renowned artist Kevin MacPherson in the area around Angles sur l'Anglin, France, designated by the French government as one of the most beautiful villages in the Loire Valley. Don is represented by the Landmark Gallery in Kennebunkport, Maine, the Robert Paul Galleries in Stowe, Vermont and the Amsterdam Whitney Gallery in New York City. Don was featured in the September 2007 issue of American Art Collector Magazine. 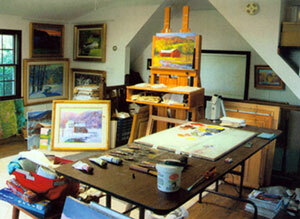 He teaches oil landscape painting at the National Art League and holds outdoor workshops in Vermont and Gloucester, MA.